T.Webber provides complete leak detection and leak repair services throughout the Hudson Valley. Because plumbing leaks often occur underground, within walls, or beneath a home’s foundation, it can sometimes make them hard to locate – or worst still, they may go completely undetected. Left unresolved, plumbing leaks not only waste water, but can cause significant property damage to your home. You notice that there are hot spots on the floors. A good way to help you find this is to pay attention to where your pets lay. They like the warmth, so if they are consistently nestling into one spot, that’s a good indication. Think you have a plumbing leak somewhere in your home? 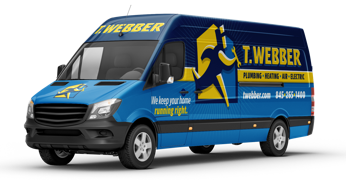 Call the professionals at T.Webber. Our team of Plumbing & Drain Experts has the tools, knowledge and experience to locate the source of your leak and take immediate corrective action. Our team works to be as non-invasive as possible – only opting to open up walls, floors or ceilings as an absolute last resort. And even then, only with your approval. After identifying the source of your leak our Plumbing & Drains Experts will review multiple options for repair – from small spot repairs to larger, long term solutions – educating you on each recommendation. Our fully-stocked trucks allow us to complete most repairs in the same day, eliminating costly and inconvenient return trips. And of course, all of our work comes with a 100% satisfaction guarantee. For complete leak detection and leak repair services throughout the Hudson Valley – call T.Webber. Our technicians are standing by to serve you.